A lot of people think of summertime vegetables when they think of local produce – bright shiny tomatoes, corn, green beans, and more. 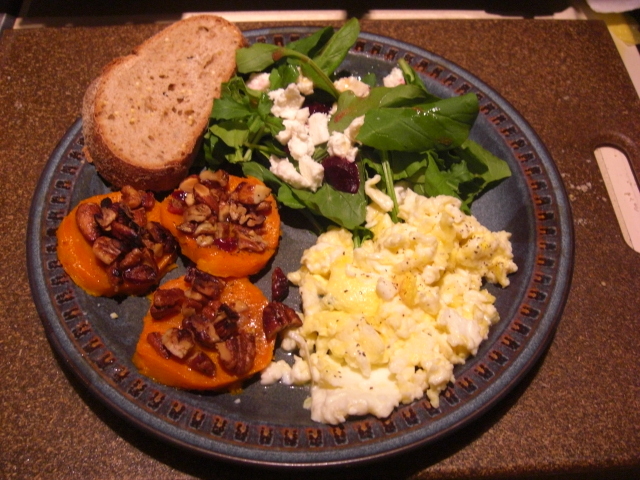 But I think fall produce is way yummier: salads, greens, and winter squash. It’s also much more pleasant to “slave over a hot stove” when the days are cooler and the nights are cooler still. So here are some recent autumnal meals we’ve had with local produce from Farmers’ Fresh. They’re repetitive, but we love them. If you’ve been overwhelmed lately with greens and winter squash, maybe this will provide some inspiration. 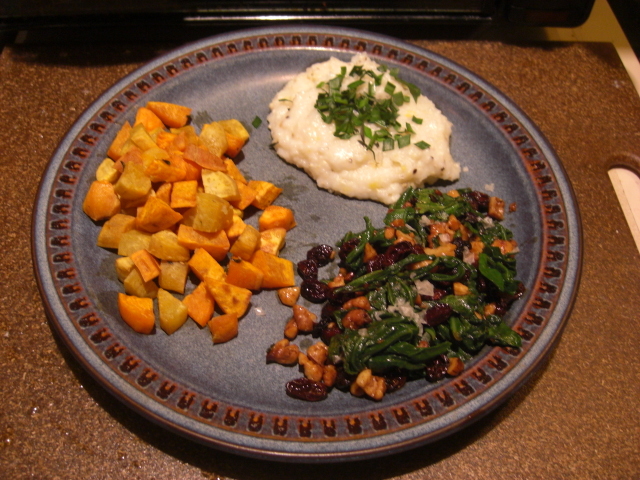 sweet potatoes roasted with olive oil, salt, and winter savory, grits topped with chives, and Komatsuna greens cooked with raisins and walnuts. 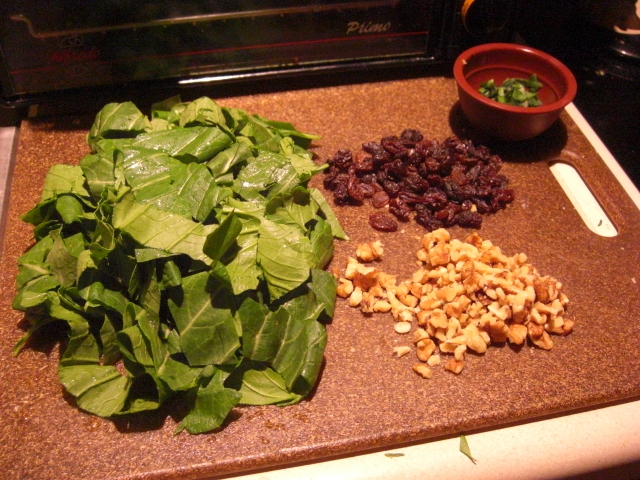 Start with washed, chopped greens, some raisins (or craisins or dried sweet cherries), and walnuts (or pine nuts). Sauté the nuts and fruit in olive oil until they’re brown and toasted (five minutes or less). 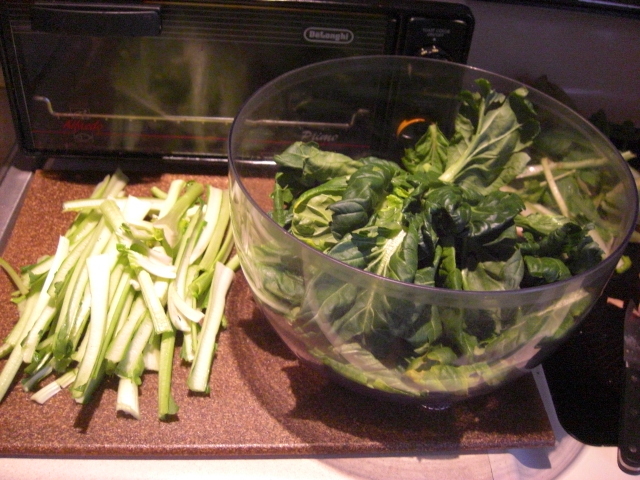 Remove them and sauté the greens until they are wilted (again five minutes or less, although it will depend on the type of greens). Add the nuts and fruit back and mix them together for a minute. Salt and serve. So far, we’ve used this recipe with mustard, turnip, tatsoi, beet, kale, and Komatsuna greens. The only thing that hasn’t worked so well is arugula, but that might have been user error. Here’s another example with tatsoi leaves. 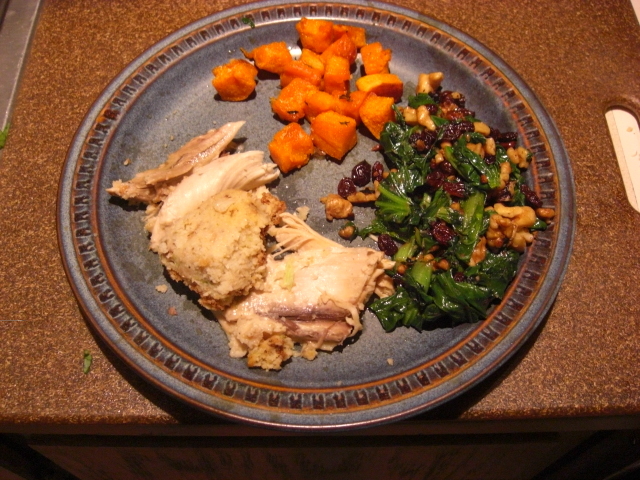 leftover turkey and dressing, roasted butternut squash, tatsoi greens with raisins and walnuts. Tatsoi has pretty dark leaves at the end of long stems. To me, it seemed easiest to use the two parts separately. The leaves we ate as shown above, and the stems we used in a lo mein dish below. Actually, we used a bunch of things in this lo mein. Lo mein is great for using up bits and pieces of produce. 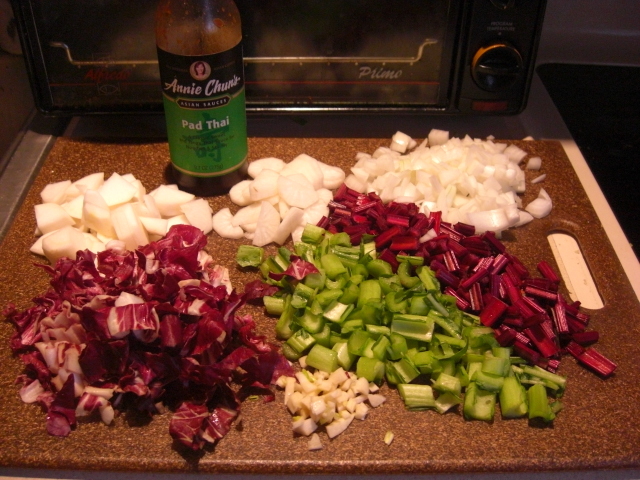 aging radicchio, Asian turnips, the all-important stir-fry sauce, daikon radish, onion, beet stems, tatsoi stems, and garlic. 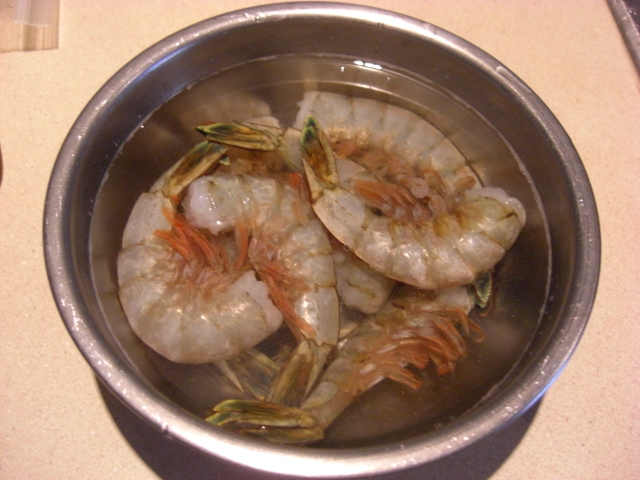 The first step (even before all the chopping) is to defrost a handful of shrimp. These are the sustainably harvested Georgia coast shrimp available at the Farmers’ Fresh store online or in Carrollton. They’re also very, very good. Cook some pasta al dente. vegetables in order of how long they need cooking: daikon radish, Asian turnips, onions, tatsoi stems, beet stems, and radicchio. The vegetables will cook the longest. Taste them to see when they’re ready. Then remove them. Add the stir-fry sauce along with some of the pasta water if it’s still around. Maybe a splash of rice vinegar and dark sesame oil. Then add the pasta and cook in the sauce for a couple of minutes. Add back the shrimp and eggs and then the vegetables. Heat through and serve. We’ve baked one butternut squash this week three ways. The first was sliced and baked with Nutty Girl’s rosemary nut mix. I sliced six pieces off the neck of the squash and baked them in the oven covered and with a little dish of water in the hopes it would keep them from drying out. Once they were done, I brushed them with olive oil, topped them with nuts, and put them back in for a few minutes. I kind of overdid the nuts here, but it was still really good. The second butternut venture was roasted cubes. I cubed the remaining section of the neck and tossed the cubes in olive oil, salt, and winter savory. Then I roasted them for about thirty minutes at 350 degrees. 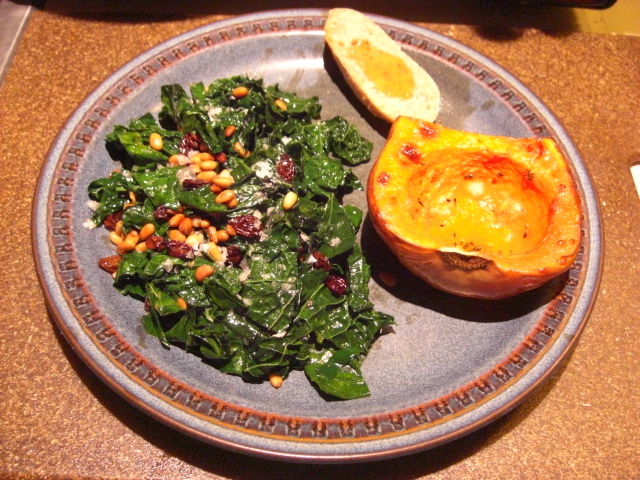 We ate the last of the squash last night with the original greens recipe: (Tuscan) kale with raisins and pine nuts. Yum. I baked the bottom of the squash in a dish at 350 for about an hour. I sat it up on its bottom and covered the top with tin foil so it wouldn’t dry out. Once it was a little browned and soft, I took it out, cut it in half, and removed the seeds. Then I dropped some sea salt, chopped savory, and a splash of olive oil in the cavity. I brushed some of the oil over the rest of the squash, too. Then the two halves went back in the oven cut side up for maybe ten minutes until everything was nice and soft. This method worked great, and we ate it down to the scraped skins. And there are seeds to toast the next day. After removing the seeds from the squash, I rinse them, leave them out on a paper towel for a few hours, and then remove the towel and leave them on a plate over night. They’re dry enough to toast the next day. 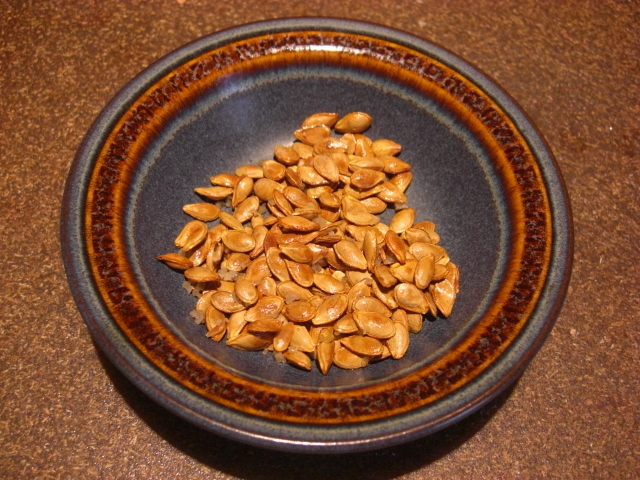 I tossed these seeds in olive oil and salt and toasted them in the toaster oven for a quick afternoon snack.